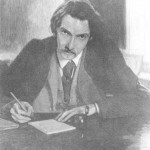 The Edinburgh Robert Louis Stevenson Club and Edinburgh Napier University have for three years collaborated on running a competition which aims to inspire young writers in Scotland by asking them to produce a piece of creative writing which draws on the rich and rewarding legacy that Robert Louis Stevenson has left us in his works of fiction, poetry, travel writing and essays. The competition for 2018-2019 is now open, and we’ll be accepting entries from now until the closing date of 18th April 2019! For full competition details, read the Competition Leaflet. Get writing! There are three categories: fiction, poetry or reflective writing. As well as a chance to take part in our fantastic writer’s workshop with Louise Welsh, there are prizes of £100 for the best entry in each category. There is also a special award for the best entry in Scots in any form. Good luck, and enjoy writing! If you want to spread the word, feel free to download copies of our poster!